Preparing for Banned Books Week at the library (September 30-October 6), I’m getting excited ahead of time. The American Library Association (ALA) has several cool badges and banners available to download for free (remember to give credit for the images if you use them). Reprinted by permission of the American Library Association. On the ALA site, you can also see lists of the most frequently banned/challenged books, by author, year, or decade. You can also see that almost half of the Radcliffe (now Columbia) Publishing Course Top 100 Novels of the 20th Century have been challenged or banned; if you did any of your assigned reading in school, I can pretty much guarantee that at least one of those books is on that list. The most frequently challenged/banned books list is overwhelmingly comprised of classics (think To Kill A Mockingbird and Brave New World) and young adult literature (The Giver, A Wrinkle in Time, Harry Potter). The most common reasons for challenges are “sexually explicit,” “offensive language,” and “unsuited to age group,” and the most likely challenger, by a tremendous margin, is a parent. 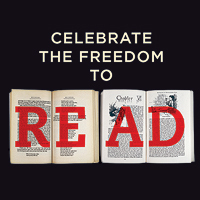 Let’s all celebrate our freedom to read, not just September 30-October 6, but all year, every year – because reading is magic. nice article. and makes me proud. i’m sure i read plenty of books that if my parents knew….they still wouldn’t have said no.